The folks at the Amsterdam offices of ad agency Wieden + Kennedy have taken the experience of the awkward holiday dinner to a whole new level thanks to technology. They’ve created a Virtual Holiday Dinner Party by attaching small flat screen monitors to the top of five robotic life-size dolls dolls seated around an elaborate holiday table setting. 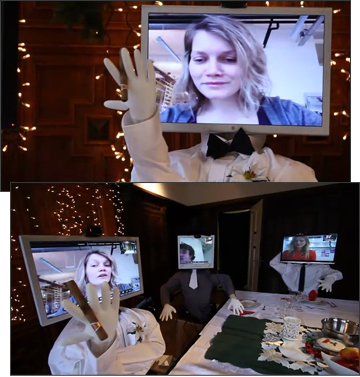 People from around the world attend the virtual dinner party as guests via Skype with their face appearing on the screens mounted on top each doll. Facial-tracking software follows your face and rotating the doll’s body and the guest’s view of the party. This is the second year that the agency has hosted the Virtual Holiday Dinner, and spaces can be reserved for one of the 20 half-hour sessions happening on Dec 15, 16 and 19. To liven up the conversation, guests can choose from one of three dinner conversation themes that come complete with on-screen scripts. ‘The Business as Usual Dinner’ puts the guests in the middle of an agency client holiday sit down (oh, the hilarious awkwardness), while ‘The Resolutions Dinner’ features a series disturbing resolutions for the new year, and ‘The Overly Friendly Holiday Dinner’ will surely have you wishing for the holidays to be over as soon as possible.